Extraction and purification of DNA is the first pivotal step for ensuring the success of downstream processes in molecular biology. Cloning, sequencing, and efficient PCR amplification all hinge on the isolation of high-quality purified DNA. DNA quality and purity can be effected by a number of factors including: sample size, the presence of contaminants in a sample, nucleic acid degradation during preparation, and the efficiency of lysis during sample preparation. Standardized kits for DNA isolation and purification offer several distinct advantages over traditional piece-meal solutions. In addition to providing a rapid and efficient method for high-yield extraction of purified DNA from a variety of sample types, the reagents in DNA extraction kits are specially formulated to minimize the presence of contaminants and reduce nucleic acid degradation during preparation. The easy-to-use, step-by-step nature of DNA extraction using a pre-formed kit also helps to minimize user-error thereby ensuring consistent isolation and minimal sample-to-sample variability. Magnetic beads from MagnaMedics are silica based with have a large microporous surface. Various beads are available differing in size, magnetic strength, and surface functionality. Standard bead sizes are 300 nm, 600 nm, 1.0 µm and 3.0 µm. The beads consist of many ferromagnetic grains with randomly oriented magnetic moments, encapsulated in a non-magnetic silica shell. The size of the ferromagnetic grains is about 10-15 nm. 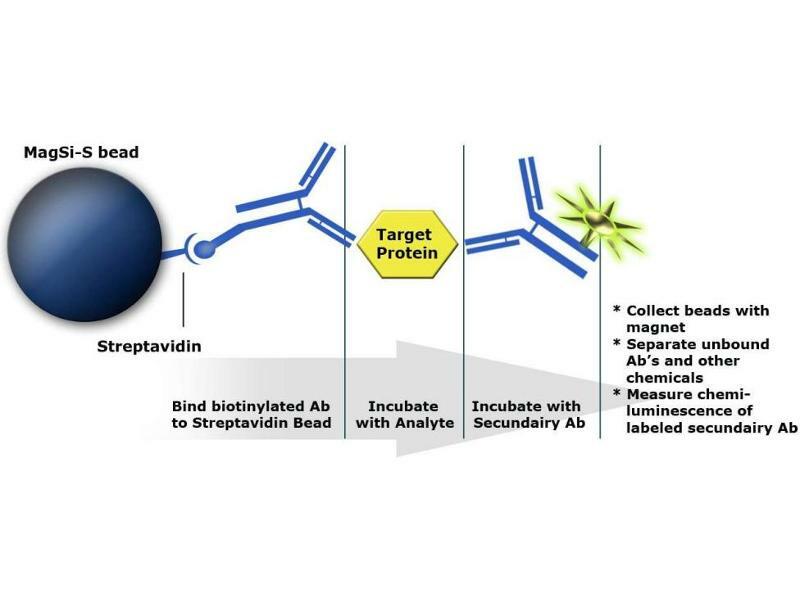 Due to the small size and random orientation of the magnetic moments, the beads behave superparamagnetically and the magnetic moment without a magnetic field is 0.
antibodies-online.com offers beads with different surface functionalities, where your antibody of interest can be coupled to by yourself, but also beads with a surface coating of streptavidin and specific beads to bind DNA. MagSi beads e.g. can be used as solid support phase in DNA extraction and purification in a simple bind/wash/elute protocol (see figure 1). These beads are intended for the development of custom protocols and are suitable for various sample sources and buffer systems. MagSi beads for genomic applications are available with a range of physical properties and a silica or carboxyl modified surface. products. If the desired product is not listed please do not hesitate to contact one of our technical support scientists.